Arrive to Nairobi, Kenya, where you are met and escorted to your hotel. Overnight Ole Sereni, Deluxe room. As 'The City Hotel by the Game Park', Ole-Sereni combines the best features of a modern City Hotel and a traditional wildlife lodge where guests can enjoy nature's tranquility from a very close range. The hotel offers its guests views of animals in their natural surroundings at the waterhole in the Nairobi National Park from the restaurants, bar, swimming pool and other parts of the hotel. Ole-Sereni is strategically positioned close to the Airport and the city center, offering world-class facilities and personalized services to business as well as leisure travelers. Samburu Intrepids Camp's location deep inside Samburu National Reserve guarantees close encounters with the region's wildlife. Situated on the banks of the Uaso Nyiro River in the arid heart of Samburu National Reserve, Samburu Intrepids looks out over riverbanks where herds of elephant, buffalo and zebra come daily to drink - together with the rarer 'northern species' of reticulated giraffe, Beisa oryx and long-necked gerenuk antelope. Samburu Intrepids offers guests early morning game drives, walking safaris with skilled Samburu guides, sedate camel rides and raft trips when the river is high. 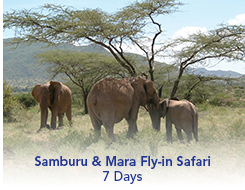 There are also trips to local Samburu villages. Comprised of 50,000 acres North-East of the Masai Mara National Reserve, Mara Naboisho Conservancy provides an exclusive safari experience. The land includes contributions from over 500 Masai landowners and conservancy fees are directed back to these landowners, providing them with a sustainable livelihood. 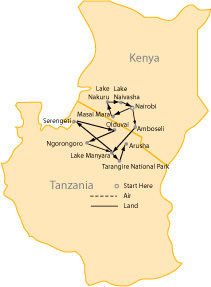 The Mara Naboisho Conservancy also limits the number of tourists who may enter the area, thereby reducing the crowds of vehicles. Guests often find themselves the only vehicle around, giving spectacular, unspoiled views of exciting wildlife. Encounter Mara is hidden away in a forest on the banks of the Olmorijio River and each living area allows views over the surrounding plains and valley. The camp has been built with minimal impact to the surrounding environment and the canvas structures melt into the bush. Giraffe and zebra are daily seen drifting past the camp, along with a host of other plains game and colourful birdlife. The salt lick directly in front of the camp is a popular source of natural minerals for a variety of animals and guests may often feel the urge to simply remain in the comfort of the camp and watch the unfolding of events with a cold drink in hand. No pathways cross in front of guest tents and private verandas and hammocks give ample opportunity to soak in the ambiance in complete and blissful privacy. Each of Encounter Mara's twelve spacious tents features their own private veranda with a view over the surrounding savannah. Tents are constructed out of canvas and natural materials and furnished with handmade furniture. With a generous spacing between tents, guests have an entirely private space for personal relaxation. The Encounter Mara Tented Camp boasts simple and elegant décor, soaking in the beauty of the surrounding bush. Our lounge tent is a great place to while away the afternoon, scanning the natural salt-lick in front of camp for the wildlife that is often attracted to it. Have a cold drink as you flip through our books and magazines or play one of our board games with the kids.